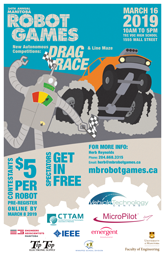 Welcome to the Manitoba Robot Games and thank you from the executive committee! These games could not happen without the help of volunteers like you! At the heart of all our games we believe that the competition should be decided upon the playing fields with a sense of fair play exhibited by all competitors. The vast majority of our competitors are children and, as such, we want them to have a positive experience and have a chance to compete fairly. This series of videos are information and training aids for judges and timers in the popular sumo competitions at the Manitoba Robot Games. After checking in and receiving your volunteer t-shirts, all judges and timers will usually meet behind the stage where they will be teamed up, receive a numbered clipboard and stop watch. The number on the clipboard corresponds to a ring in the games. You will stay at that ring and the competitors will come to you. Your ring will be the host of one pool in the round-robin, so you will get to know the robots and competitors. There will be a “meet and greet” at the start of the event so that we can make sure all competitors know which ring they will be playing in. Introduce yourselves to the competitors so they know who you are. Ask them to stay close to the competition area, and to let you know if they need to go away for a few minutes. Designate a place for the contestants to sit while they are not competing. Make sure that it is not between the ring and the bleachers so that the audience can see the matches. You will receive a print copy of the event rules and a scoresheet of the round robin matches in which to record scores. You need to hand these in at the end of the competition. Timers should practice using the stop watches to make sure they know how to start, stop and reset time. Please return the timers to the table behind the stage. The head judge: if you have a difficult decision or a competitor challenge you can’t resolve. The games marshal: who runs the event and makes sure the competitions are running smoothly. You can consult this person for advice if there are delays or late competitors. This person will have a microphone and can call competitors who are needed at the rings. The announcer: a person with a microphone who can call competitors who are needed at rings. The score keeper: you will report your scores to the score keeper who records it on the big scoreboard. Try to report after each match or two. As a team – the judge and timer will oversee the matches and apply the rules of the competition. Follow the MRG goal of fair play in all matches – we want everyone to be able to compete in a safe and fun manner. Ensure that the competitors display appropriate sportsmanship. Keep the matches moving along in a timely manner. Keep the games going by calling the competitors for the next match as soon as possible. You can ask the games master or announcer to make the call for you. If you need to leave the ring, please let either the games master or head judge know so they can find a fill in for you. If you are a timer, please pass your timer on to the person filling in or replacing you. Judges and timers will meet behind the stage to get their supplies and get teamed up. Familiarize yourself with the timer and score sheet. You will be assigned a ring. A round robin pool will be assigned to that ring. Manage your round robin by calling competitors for matches. Please let someone know if you are leaving. Episode 2.5: Using a score sheet. Quick demo on using a score sheet. In each of these events the robots may be tethered (under the direct control of an operator) or autonomous (computer controlled). Regardless of the event the basic rules and the roles of the judges and timers are essentially the same. The Sumo events are made up of round-robin pools. In the pool matches, the winner is the first robot to get two points. All matches have a time limit of 3 minutes. Two mini-sumo robots are competing, judge and timer are watching the action. Middle shots of robots going off the ring. Judge pointing to the winner and marking a score on a clipboard. NARRATOR : [voice over] Each match consists of up to three rounds. These rounds must be completed within a combined time of 3 minutes. The first robot to win two points within the time limit is awarded the match. The judges will decide when a point is scored. A robot gains a point if any part of their opponent (except for the tether) touches the floor, or, if the opponent is incapacitated. Hanging off the side of the ring is not out! A robot is incapacitated if it is turned over or stops working. The timer calls time. And the competitors stop. Technical merits in movement and operation of a robot. Attitude of the players during the match. Which robot exhibited the best effort. Mid shot of competitors with robots in the ring in deadlock. However, if no obvious superiority exists and a winner cannot be determined, an extra one minute match on a reduced size playing field may be played. If you cannot resolve a match or there is an irregularity – call the head judge. Sumo wrestling is a best of three match, with a maximum time of three minutes. A point is scored for pushing the opponent off the playing field, or if the opponent is incapacitated. Draws are decided by the judge in consultation with the timer and based on merit, attitude and effort. A one minute tie-breaker may be added if a winner cannot be decided. Call the head judge if you have a problem. At the end of a match, clearly mark the score on your score sheet and repeat the score to both competitors. Ask them to shake hands and congratulate them for their efforts. Then call the next competitors on your round robin sheet. As you are waiting for the competitors you can go to the score keeper and report your scores. Try not to obstruct the competitors or the audience’s view of any of the rings. Judges and timers should stand on the side of the ring opposite the audience and a few steps away from each other. Also stand a few steps away from the ring to allow the competitors to move around. Only one competitor per robot is allowed to be at the ring. The competitors will report to the ring and shake hands with each other. Remind them if they forget. At the judge’s instruction, the robots are placed in the playing field 20 cm (the width of a clipboard) apart for Prairie Sumo and 10-15 cm apart in Mini Sumo and equal distance from the centre of the playing field. The robots are set down parallel to each other and facing opposite directions. Only a competitor should touch their robot. If a robot needs to be re-positioned at any time, ask the competitor to do so. Is there a loop in the tether? Is the tape on the tether outside the loop? Is their tether off the surface of the ring? Does the robot appear safe to compete? Are there any loose parts, leaks or mess coming from a robot? Request that they be attended to. Is anything smoking? Immediately disconnect the battery or hit the kill switch. Are there any sparks, flickering lights or other apparent electrical issues? Ensure all wiring is properly connected and secured. Has either robot changed since the first time you saw it? When both contestants are ready, the judge will signal the start of the three minutes. No movement at all must occur before the official start. It is a good idea to go over how you will start the match the first time you see the members of your pool. Once the robots are placed properly, the judge will hold the clipboard vertically in between them (Like a partition). Ask if both competitors are ready; point at them, look them in the eyes with a questioning look (raised eyebrows) and nod. Deaf competitors will nod back if they are ready. When you point, use the ASL sign for “r”– cross your index and middle finger. With your hand directly above the clipboard, begin an even, three-second countdown using your fingers and voice: three, two, one, zero. In ASL, you sign the number three with your thumb. On zero, raise your clipboard and step back far enough that the competitors can move between you and the ring.. The timer starts the stop watch. If you are able, you may want to stay low to the ground, as it makes it easier to judge if a robot has made contact with the ground. The timer should call out significant times as the match progresses. “2 minutes left” “One minute left” “30 seconds” and then count down the last 10 seconds. If, during the match the competitors’ tethers begin to entangle – motion with your hands and tell them to move to avoid this. If they eventually entangle stop the round and restart the robots. A competitor may halt the start, just once, no later than 10 seconds upon the start of a round without penalty. This allows for last moment emergencies like forgetting to plug in a battery. The start can be delayed no longer than 60 seconds. Timers: Do not stop time. The match must be completed in 3 minutes. At the end of a match. Clearly mark the score on the score sheet and confirm with the competitors the name of the winning robot. Have the competitors shake hands. If there are marks or there is a mess made on the ring – make the competitor responsible clean it up. We will have towels and spray cleaner nearby, but the competitor is responsible for leaving the ring ready for the next match. At the end of the round robin. Report to the games marshal that your pool has finished the round robin and hand them your score sheets. Handing in your score sheets is very important for the official tabulation of results and tie breakers, when necessary. For many reasons, competitors will often not arrive at the ring on time. We want our competitors to participate – so some leniency is allowed, but we need to keep the games moving along. [Voice over] Contests WILL start within a reasonable amount of time once the match is announced. Consult the games marshal if a contestant is consistently late or absent. In some cases, if the competitor is having major difficulties with their robot and is frantically working on fixing it, the judge may simply call the next match in the round robin and continue the matches. Later on, the missed matches can be made up. The tethers become entangled. Try to make the competitors move to avoid this. Both robots move without making progress, or stop (at the exact same time) and stay stopped for 5 seconds without touching each other. If one robot stops its movement first, after 5 seconds it shall be considered not having the will to compete. If both robots touch the outside of the playing field at about the same time, and it cannot be determined which touched first, a rematch may be called. Any robot found losing its body parts will also lose the match except for screws or nuts (each no more than one cubic centimetre) falling off. A stop can be signalled by chopping one hand down on the clipboard. Fails to respond to the announced start time. Fails to adequately clean the ring if they cause a mess or leave marks. Halts the start of a round more than the one time allowed for. A robot moves before the judges start signal. The control tether contacts the playing field surface or the competitor’s robot. Tether is tugged or pulled to assist the robots progress. In the event that this is done to keep the robot within the playing surface, the opponent will be awarded the point as if the round is lost. Record warnings on the score sheet. When a contestant receives two warnings, the contestant’s opponent will be awarded one point. A competitor or coach may challenge a ruling by a judge. If the Judge agrees to hear the challenge – a time out is called and the timer will stop time. • It should be immediate. • Should be prior to competitors leaving the competition area. The Judge will make the ruling. If the judge is unable to make a ruling, the Head Judge will be consulted and make a final ruling on the challenge that is not open to further discussion. Coaches and competitors may be referred to the head judge for clarification of any rule or ruling. The Judges and Committee members are all volunteers and as such are never to be subjected to: verbal abuse, threats or physical abuse. In all these cases please bring it to the attention of a committee member. In the event of a physical incident, the matter WILL be reported to the appropriate authority. We are happy to say that we have had to deal with very few incidents.